Today I'm going to take you through my entire process of getting from Photoshop to completed HTML. We're going to build out a set of 4 PSD mockups of a website that eventually will become a WordPress theme. It's a massive tutorial, so if you're going to follow through to the end, make sure you have a few hours to spare! Get your PSD file converted to HTML5 and CSS3 with a three-tier responsive layout (desktop view, tablet view, and mobile view). You can have interactivity added using jQuery (or other technologies per your request) for dynamic content. This provider offers a very fast response time, and will complete the job within one day for just $200. He has completed 2,448 jobs on Envato Studio and has an amazing 99% customer satisfaction. If you'd like to make some money from your designs by selling them on ThemeForest, then this provider is ideal for you. He has already completed many PSD to HTML projects for submission to ThemeForest, and most of them have been approved without any problems. If you need a fast and reliable coding team to convert your amazing PSD design into HTML5, search no more. Xstreamthemes offers a very experienced front-end development team which will easily convert your PSD files to perfect high-quality, cross-browser compatible W3C Valid HTML5/CSS. Additionally you can download the full HTML/CSS/Image source files here. As you may or may not know, I've (very slowly) writing a book on WordPress theming. What we're building is actually the HTML that I'm using in the book to build the main example themes. 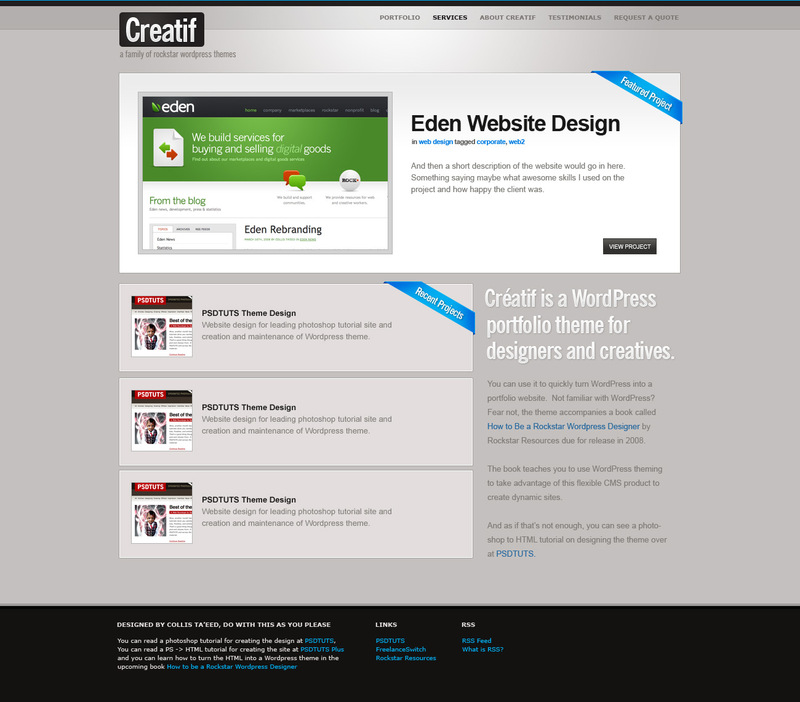 The final set of themes is called Creatif. You can see the 4 mockups shown in screenshots below (click to get the larger versions). 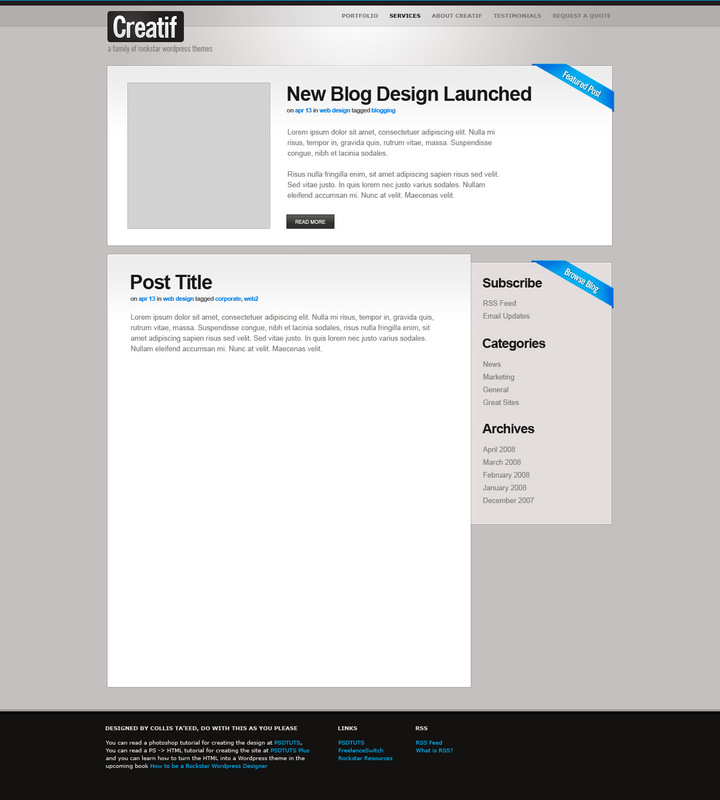 Unlike previous Site Builds this tutorial is covering a decent sized template. So we're going to take this in stages. First we'll do the framework, then the first page, then alternate pages, then finally an alternate colour scheme. So first of all we boot up our code editor of choice. I actually use Dreamweaver most of the time (and Textmate sometimes). I find it has some pretty decent code tools and a few features that I'm really used to (in particular a powerful Find+Replace and a quick <img> hook up). If you do use Dreamweaver, I recommend setting up a "Site". In any case the first things to do are create a directory structure and get ready to build. I usually have an /images/ directory and a /scripts/ directory, and then plonk all my CSS and HTML in the root. The first thing we'll do is a quick overall layout in HTML with some barebones CSS just to make sure we've got a solid foundation. We can also check it in the major browsers (IE7, IE6, Firefox, Safari) just to make sure we're on a solid footing. There is nothing worse than coming back all the way to the beginning to fix browser compatibility issues. It's much better to do it as you go. The design is centred. That immediately tells us we have to wrap it in a container and then centre that container. Essentially the design is a series of horizontal blocks. Sometimes the blocks have two columns, sometimes one. So we can do it as a series of <div>'s. This is good because we can then mix and match elements into different pages as you'll see later. We have a footer which is a different colour. This means the background needs to be that colour, in case the users browser stretches. So the footer will need to sit in a different container to the main stuff. So we're setting the body's background colour to the dark brown of the footer. Then the #main area has the lighter background. Finally you can see the .container elements have a width of 950px and are centred using margin: auto. I've also added a red border just so you can see where the elements are on the page. You can see the layout here, or view the screenshot below. The first thing we need are some images. You can make these yourself if you have the layered PSD's, or just grab the download ZIP and you'll find some I made earlier! Here's a screenshot of me saving the first image - a large background JPG. I'm using this large background image to get that radial gradient highlight, then I'll use a thin 1px slice to fill out the left and right sides so it extends off. There are multiple ways to set a background. In #main I've used a single selector which sets three properties - colour, image, image repeat. But you can also set each property individually as I've done in #main .container and #footer. Notice that because I want to apply the "background_light.jpg" image to the <div class='container'> which inside #main, but not to the one that is inside #footer, I've written #main .container. In other words, apply it only to elements with the class='container' that are inside elements with id='main'. So far so good. Don't forget to test in different browsers. Here you can see in IE7 it's looking fine and dandy! Next I've created the logo element. Because later on we'll be running an alternate colour scheme I'm going to use a transparent background PNG file. You can make these by switching off the background in Photoshop and then going to File > Save for Web and Devices and selecting PNG-24. You should be aware that PNG-24 produces pretty high file sizes. It's OK for a small image like this, but for larger ones it can be big. Anyhow you can grab the transparent logo PNG here. Rather than just placing the logo image in the HTML, we've created a <div id="logo"> and inside that placed a <h1> with the title. Then using CSS we've made the text vanish and swapped it for the logo image. This has some SEO benefits. I've placed a very quick, unstyled menu using an unordered list. By setting the display property to inline for the <li> elements, the list changes to a horizontal set of elements ... yay! Finally because our <div class="container"> element has position:relative, we can now use absolute positioning inside and set right:0px for the menu and it will be aligned to the right. This is great for a WordPress theme because as the person creates new pages the menu will extend, and this way it will stay right aligned. So anyhow at this point I stopped paying attention to IE6 :-) I'm going to have to get me yet another way to view IE6, maybe through parallels. Nothing very exciting here except that we've defined an "active" style which is the same as the :hover style (namely it's a darker shade). That means we can write <a href="" class="active"> and the link will darken. Later in WordPress we'll make it so that you can tell what page you are on at any given time. Where we have the View Project button, instead of using an image, we're going to create a 'button' class and then apply it to regular text links. This makes for a very simple, reusable button look and feel. So as I mentioned above we have the .block class which just sets a border and bottom margin. Then immediately inside we have the .block_inside element which has a white border, thin slice background (to give it that faint gradient), some padding and finally an overflow value. We have overflow:auto because we are going to have two floated elements inside. I used to use a clearing <div> but someone in my previous comments pointed out that this works just as well and is a lot cleaner! Then inside we have an .image_block class which gives our image a double border (one on the <div> and one on the <img> itself) and which is floated left with our main .text_block also floated left to form a mini columned layout. First I've updated the body tag to have a default font, colour, size and line-height. Finally we've created that button class. Note that I've defined it as "a.button", or in other words all <a> tags with the class = "button". Why didn't I just make it ".button" ? Well later on there is a good chance that I will make a second button class for <input>'s and it will be slightly different. So this way they won't accidentally interact. In the button class you will see we've set some padding, a border, a background image, a hover style and a line-height attribute ... wait a line-height attribute? Yes unfortunately this is a fix for IE which otherwise cuts off the button. Withour extra styling, the page is starting to take shape! Then we've set the image to appear 3px past the right edge and 3px past the top edge. Next we've got a <div id="portfolio_items"> which contains three identical <div class="mini_portfolio_item">'s. We'll talk about these in a second. Next we have a <div id="text_column"> which is filled with some text and a <h2> heading. What we are going to do is float the text column and portfolio items side by side to form two columns of content. We're going to replace that <h2> with a background image. 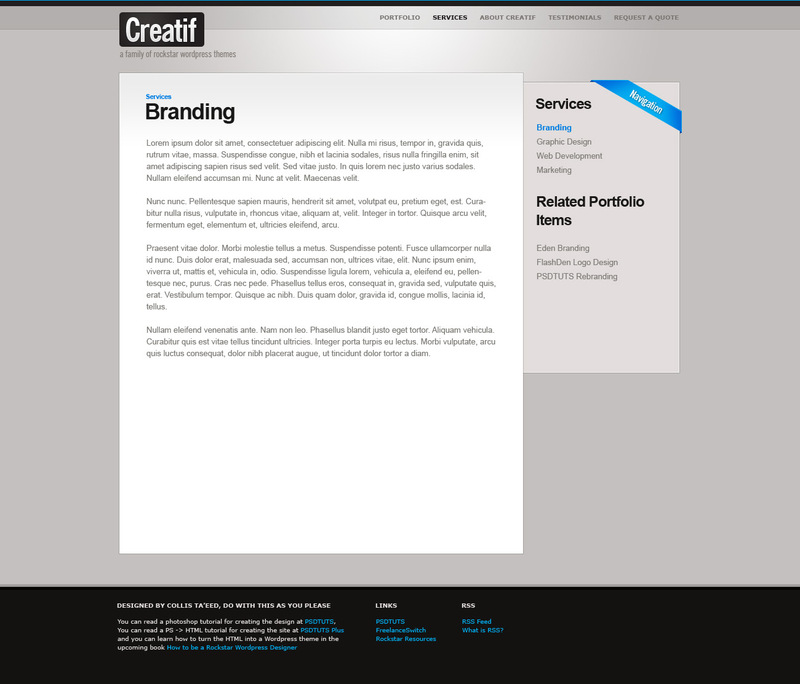 And we'll style up those mini_portfolio_item divs to look nice using a similar double border effect as we did earlier. First we've again used overflow:auto on the main #block_portfolio element. That's because we again have two floated columns and if we don't do this, they'll run over the footer. Next we've set #portfolio_items to float to the left, have a margin to separate it from the text column and a width of 615px. The #text_column is set to float to the right with a width of 310px. Inside the text column we've again done that trickery with our <h2> tag where we use a massive text-indent to make the text disappear and then instead use a background image. Next we redefine the .block_inside styles to suit these elements. Remember .block_inside was defined earlier when we did the Featured Project area. So here we are overriding the background image, changing the background colour and changing the padding. Finally we make the thumbnail images float left and have a border. Step 13 - Adding a Ribbon. I've created three <div class="footer_column">'s to house the content of the footer, we'll float these into place in a second. Since the first column is a different width I've given it a second class called "long". Note that you set two classes like this: class="class1 class2", not like this: class="class1" class="class2" which is invalid markup. Inside the columns I've used <ul> lists and <h3> tags for the headings. It's always good to use nice semantic markup, both because it makes it more readable, and because search engines like to see those headings and lists all laid out properly. We override this width for the .long column. Notice that I've set "#footer .long" instead of just ".long". The reason I did this is that "long" is the kind of generic name I might use again later on somewhere else, so it's a good idea to specify it more clearly. Step 17 - Adding a Favicon! There are lots of sites to make Favicons (Visit SixRevisions for a list of them) but I always use html-kit's for no particular reason. You just upload the image and hit Generate Favicon.ico. Now it's time to check that our markup is w3c valid! So we go to the Validator put in our code and cross fingers ... and pah-bow :-( We are not valid. I don't think I've ever been valid on the first try actually, I must have some bad habits! Fortunately the remaining 8 errors are actually the same problem. Basically I've used an inline element (specifically a <span class="block_inside">) and then tried to put block level elements like <div>'s inside. Apparently that's not allowed ... whoops! OK we have successfully made our basic page! Here you can see me testing it in IE7 and thankfully there are no bugs. With our basic framework in place we are now ready to build the extra pages and the alternate colour scheme. Happily we've lain a good foundation and will be able to make use of a lot of the code we've already written. This is why it's really important to plan ahead. If you don't plan you can easily wind up with a lot of duplication, extra code and other folly. The next page we're going to build is the blog homepage. This is similar to the portfolio homepage in that it will have a featured blog post and then a series of blog posts below. 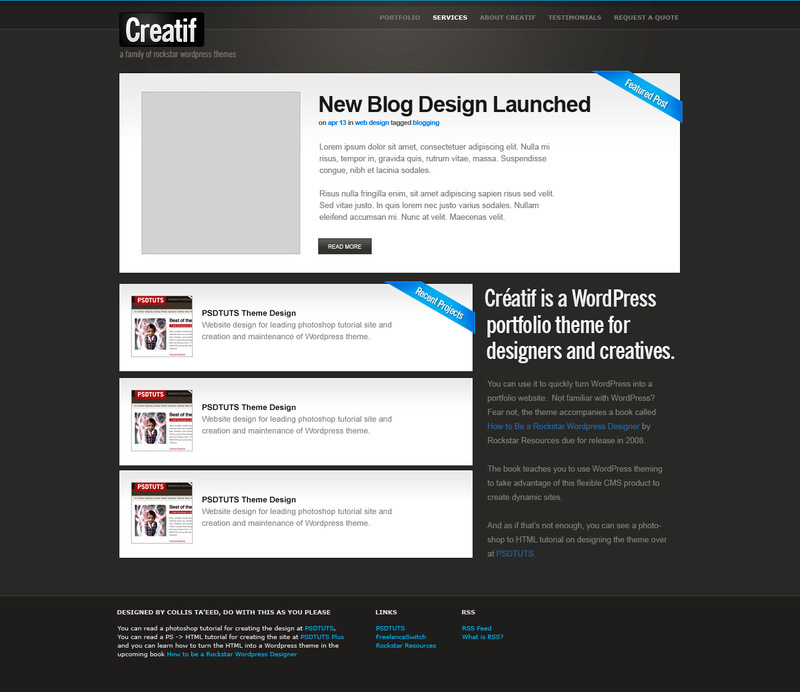 Eventually these will become two related WordPress themes - one for portfolios, one for blogs. So first we duplicate our index.html - the file we've been working on up 'til now, and call the new file blog.html. Here I've adjusted the "text_block" class but only when it's in the #block_featuredblog element. It now has a tiny bit of padding at the top and is wider. Also I've added an appropriate line-height to the heading and on a whim adjusted the text kerning by -1px. And we're finished with this element! Easy peasy! Then we've given the #content_area box and the #sidebar box each a width and a float. Next I've moved the sidebar to the left by 1px using a position:relative. I did this so that the left border would overlap and it would look like it's jutting out. Additionally I've added a 15px top margin so that the sidebar isn't top-aligned. Currently it looks a bit odd, but when we add some content it will look great. Finally I've redefined the .block_inside in the #sidebar element to override the background image and instead give it that beigey colour for a background. First in the content area you'll see I've added three dummy blog posts and in between each is an empty <div class="separator"> that we'll style shortly into a thin line with some spacing. Next we've added a ribbon image to the sidebar in much the same way as previously. Finally I've used a clearing <div> at the bottom. Now previously in this tutorial I've been using overflow:auto; to deal with floated columns, but when we add the margin-top in the previous step to move the sidebar down it messes with the overflow and creates a scrollbar. So since there may be occasions when the sidebar will be longer than the content box we're going to use this method of clearing floating <div>'s instead. And that's it, our #block_content element is complete! You can see the working HTML here. And that is that! See the final generic page here. Step 24 - It don't matter if it's Black or White! And that tells the browser that if <body id="dark"> then to override the styles for #main, #main .container, #footer, and the active and hover states of the menu, swapping in some new background images and changing the text colour to white! Easy as pie! Step 26 - Alternate Colour! And that's it! We have an alternate colour scheme all controlled by a single id tag on the <body> element. That's the magic of transparent PNG files and CSS for ya! Additionally you can download the full HTML/CSS/Image source files here and via PSDTUTS Plus you can get the full layered PSD files *and* a tutorial on designing them up. If you're looking for a quick solution, there's a great collection of website templates over at Envato Market. Starting from just a few dollars, it's a great way to quickly get started with your project, using a design that looks modern, professional, and awesome!